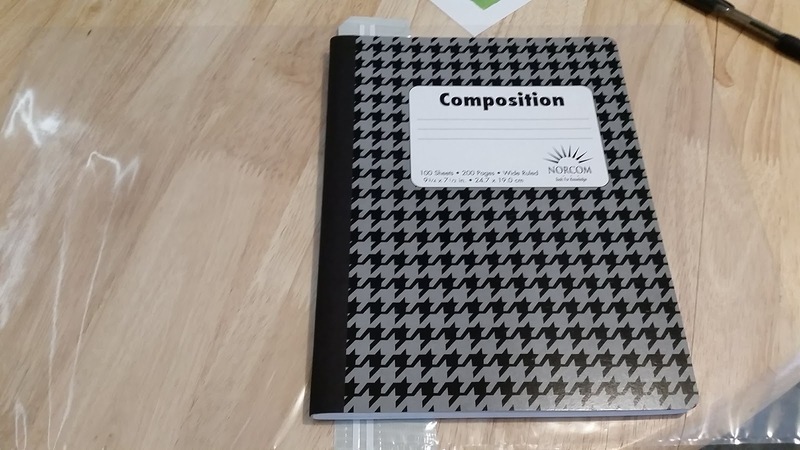 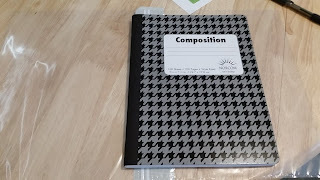 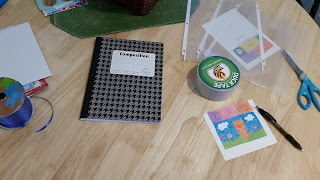 It is totally possible to purchase these "compostion books" on sale for anywhere from $ .10 to $.25 (pennies per journal). 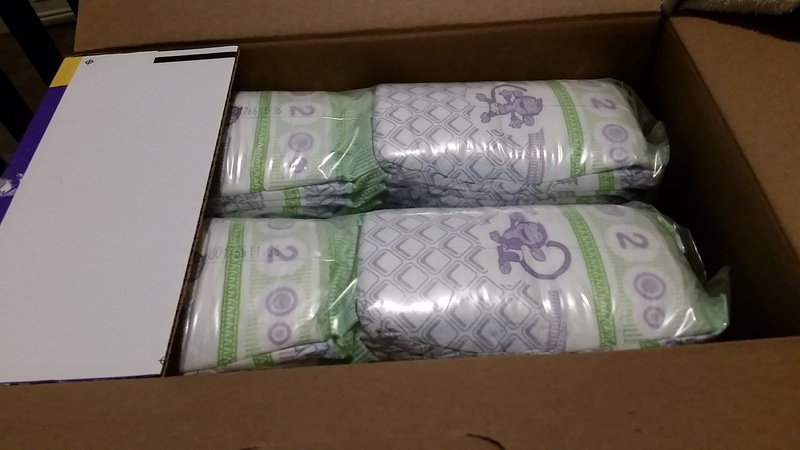 Keep your eye out for sales! 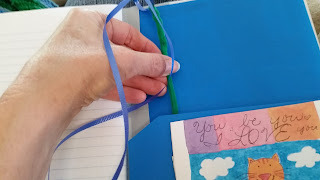 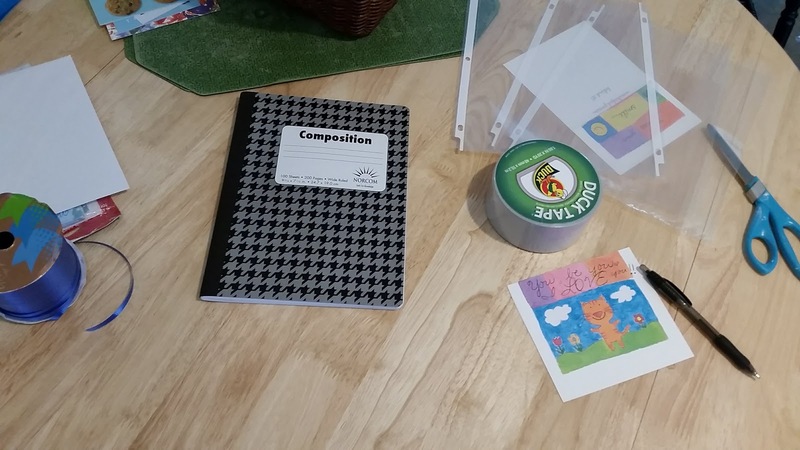 Then I used tape, glue, scissors, discarded folders (for the pockets), ribbon, fuzzy craft stick, and portfolio or plastic sheet covers. 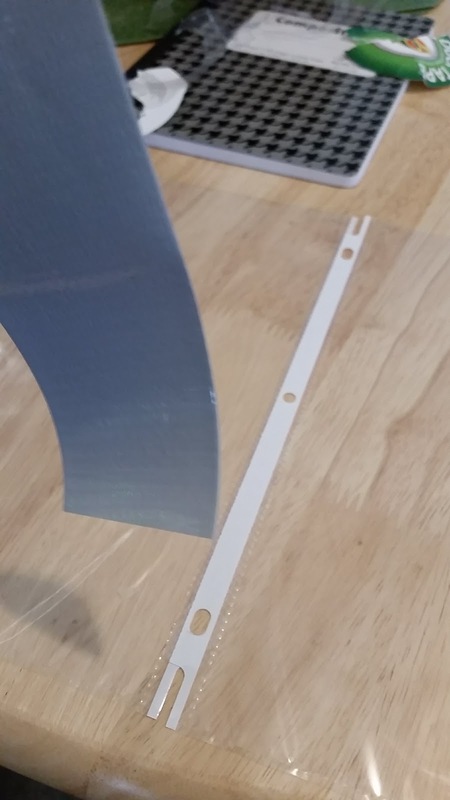 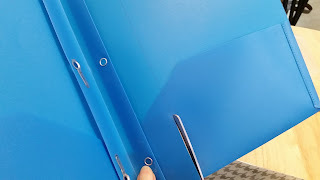 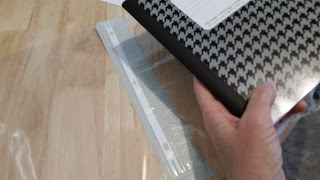 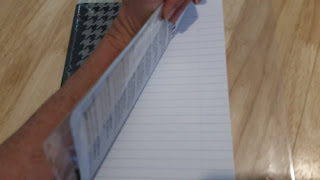 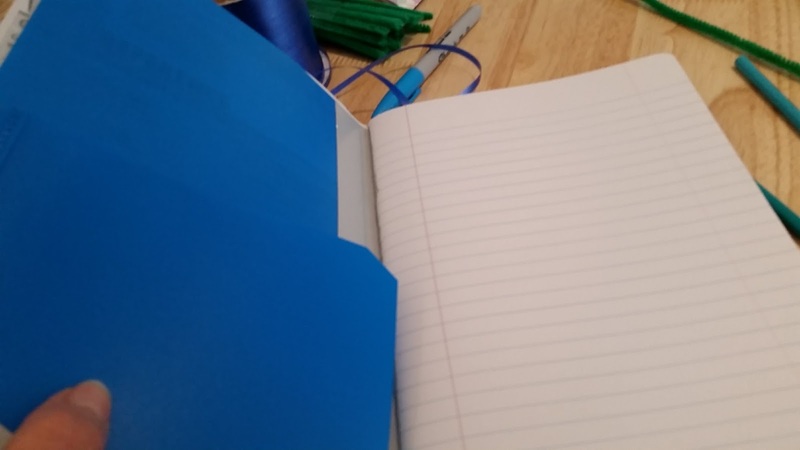 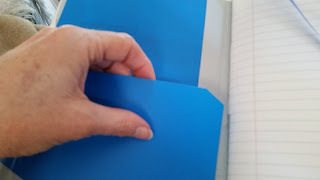 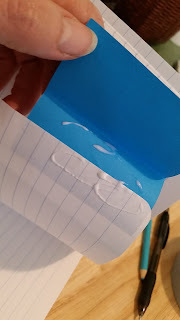 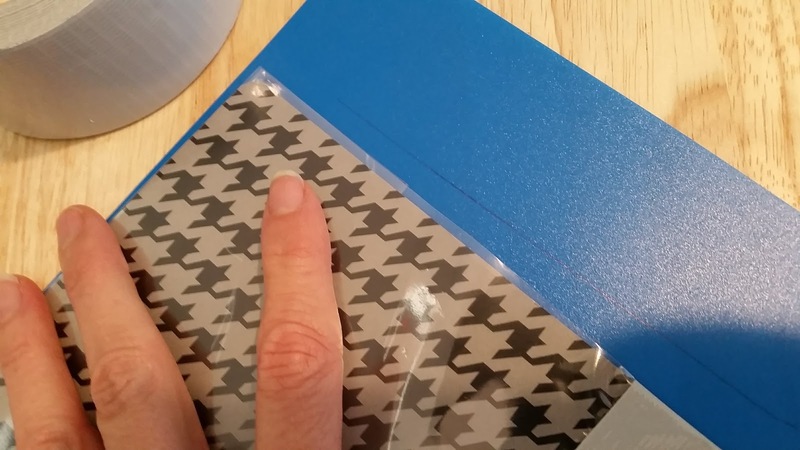 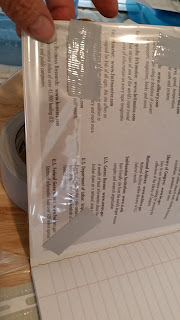 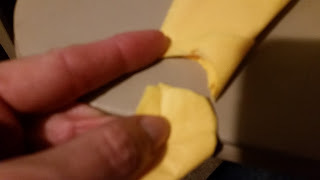 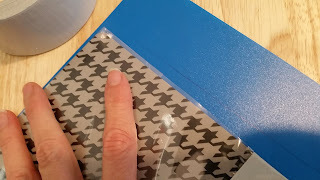 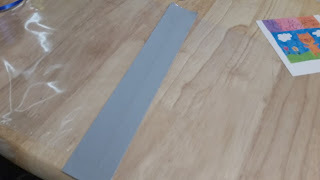 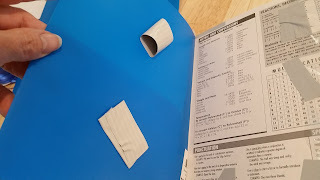 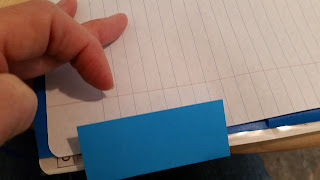 First I matched up two plastic sheet protectors at the binder hole edge and taped it. Then I used that as the journal cover!! 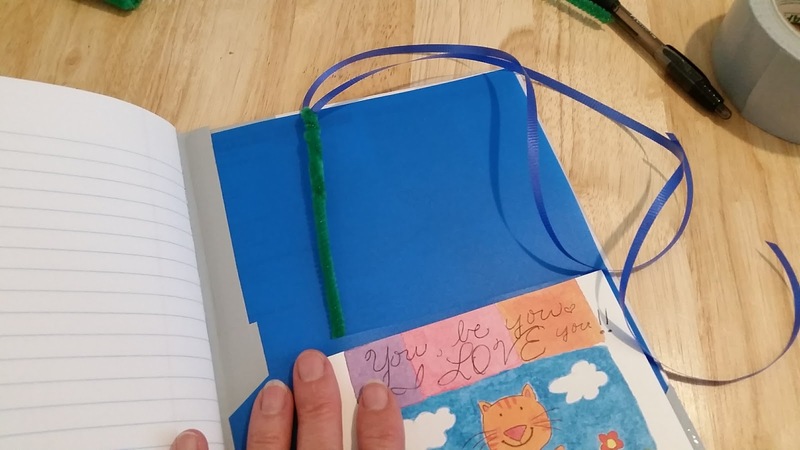 This is super cool because it provides a COVER for the journal where the user may add his/her own photo or document inside for show cover. There you have it! 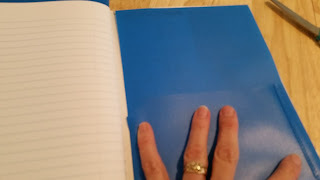 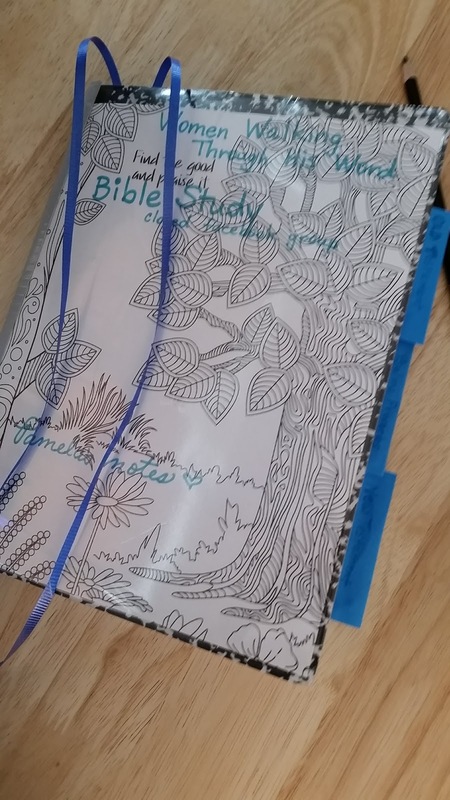 A fun, service-able journal with sections. Could translate into a very special gift for someone! Thank for letting me share. 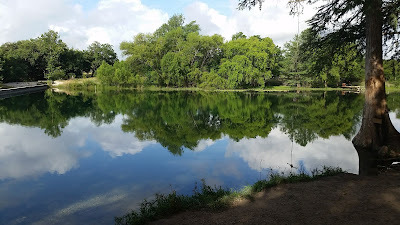 Wishing you wonderful walks in the Sonshine! 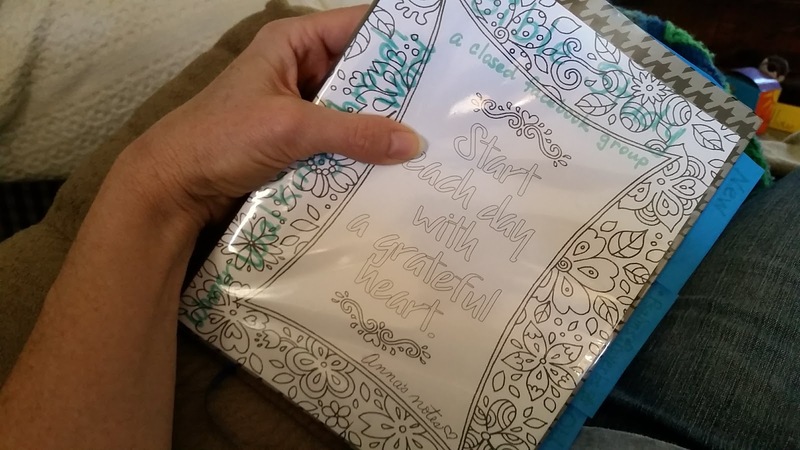 Crafties just add joy and pleasure to my life! 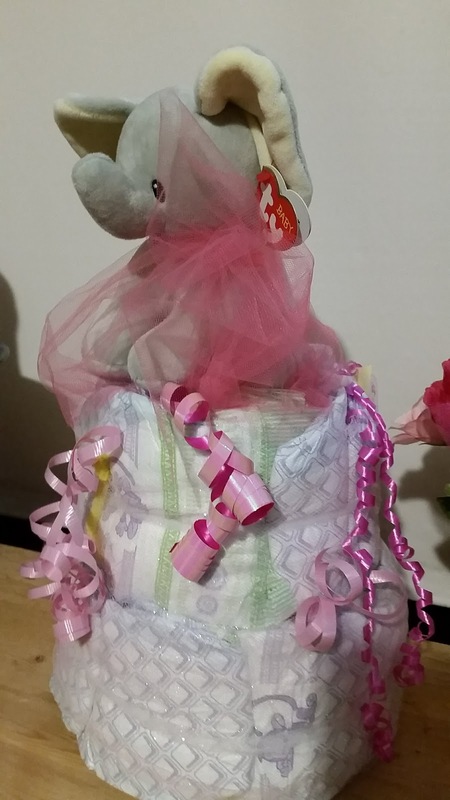 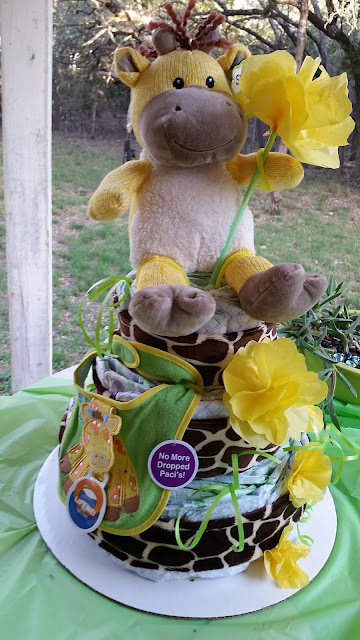 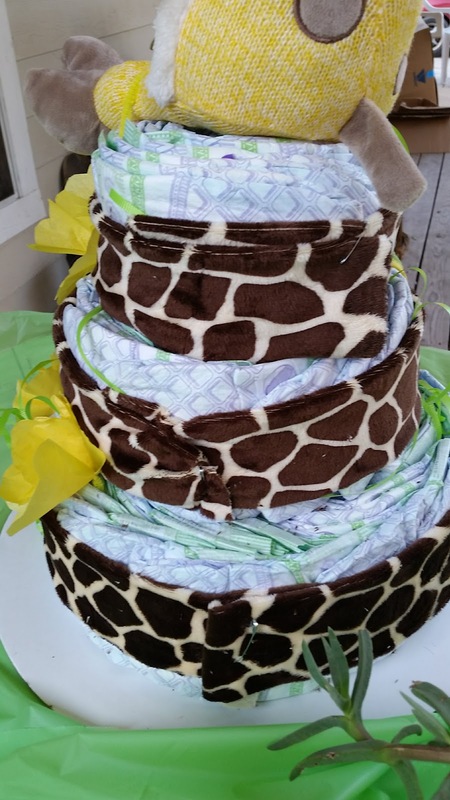 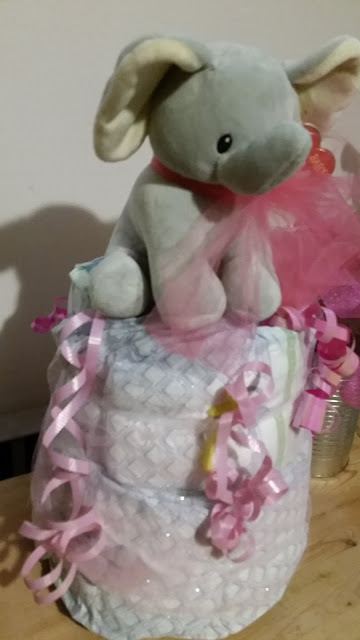 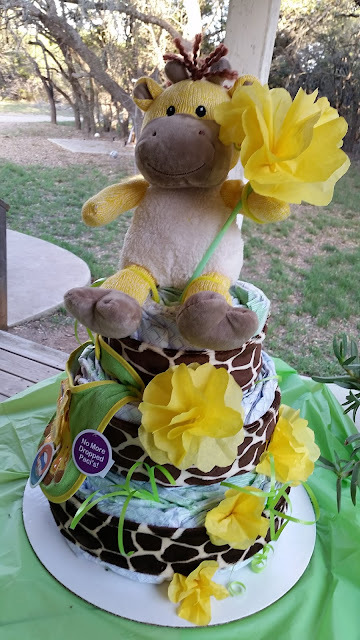 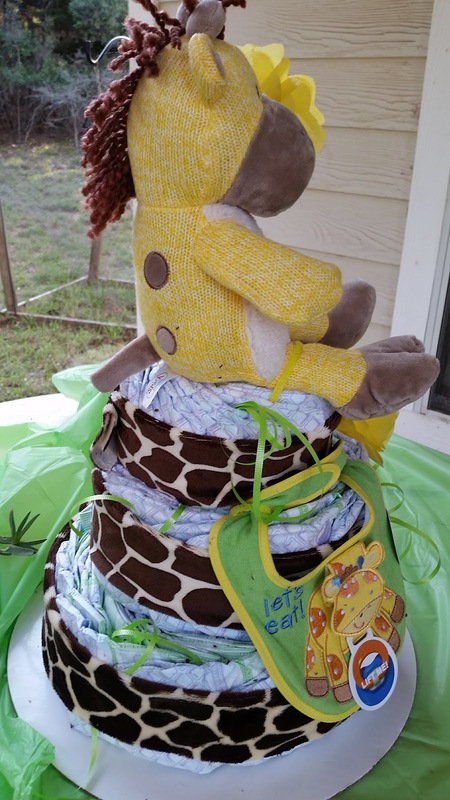 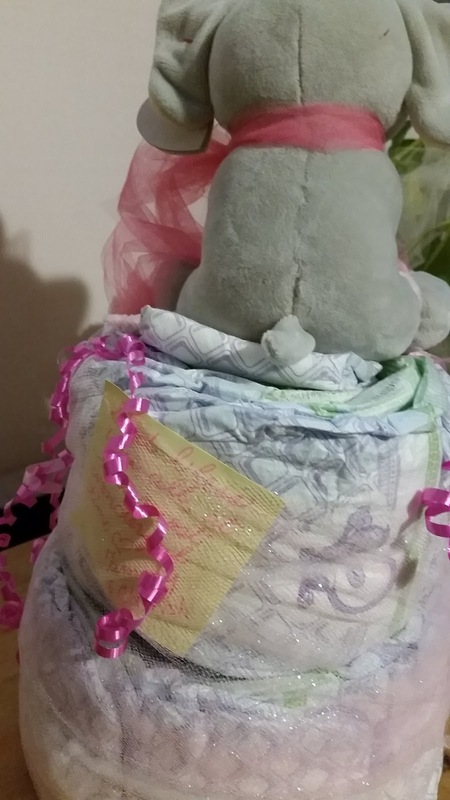 This diaper cake for an upcoming baby shower about $20 ! Will break-down the price pieces later. 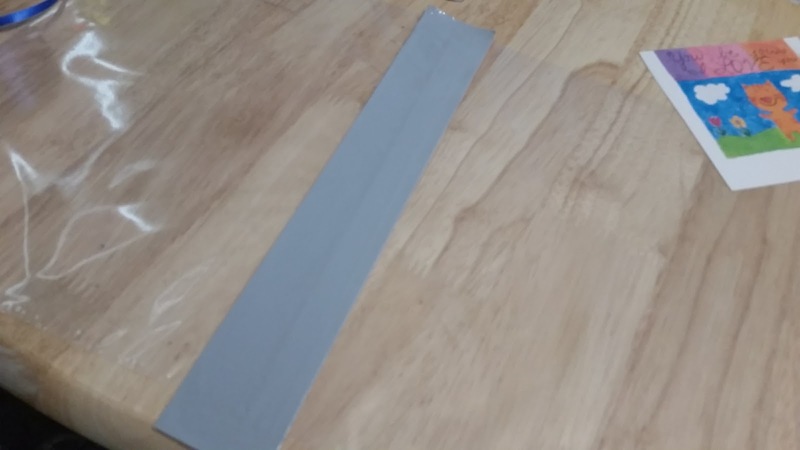 It is just plain FUN. I put baby-wipe packages in the middle to add bulk. 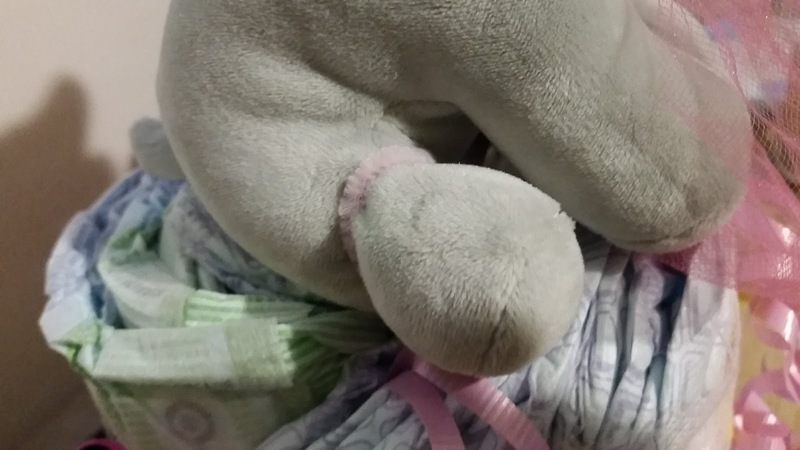 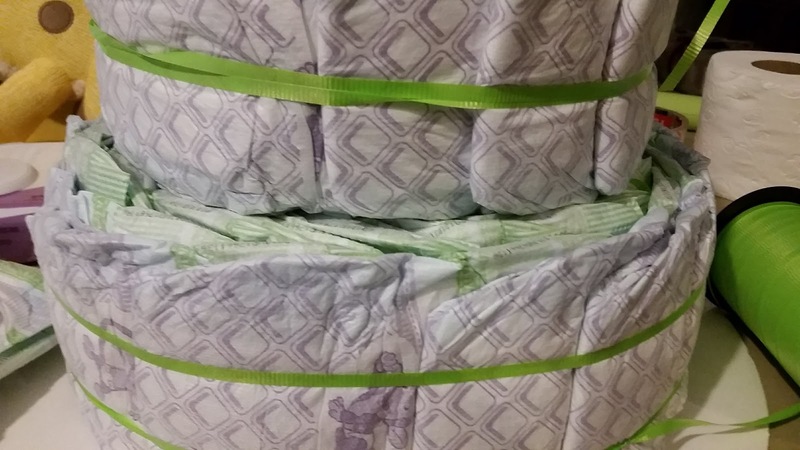 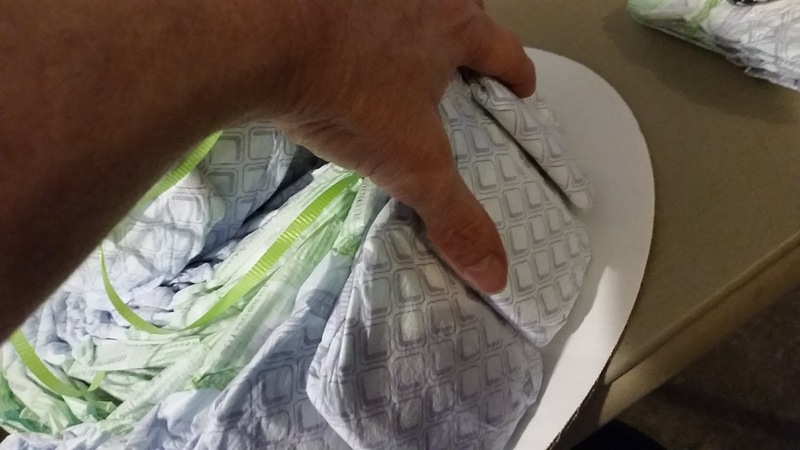 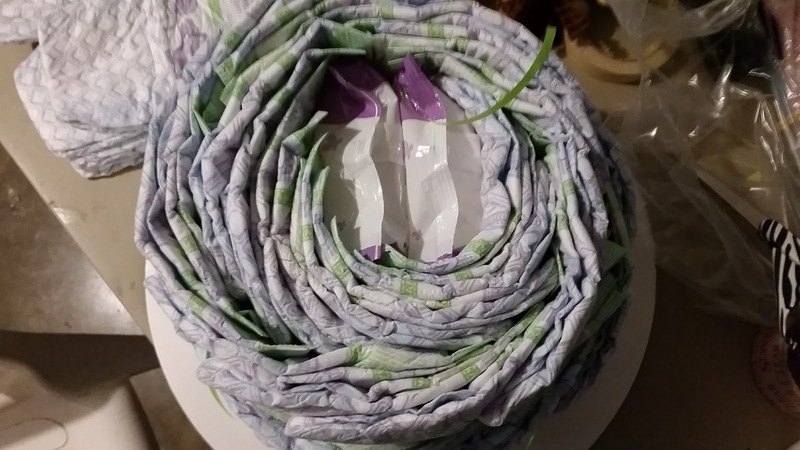 Swirl the diapers around, layer upon layer, adding where you need to. 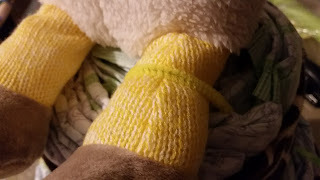 First I had the top edges of the diaper out but it was too rough or ruffley for my taste so the final layers were crotch sides out. 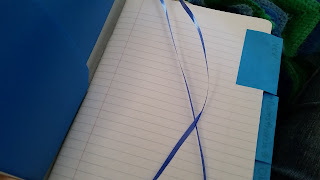 Secure in place with a ribbon! 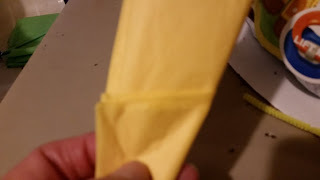 Sculpt. 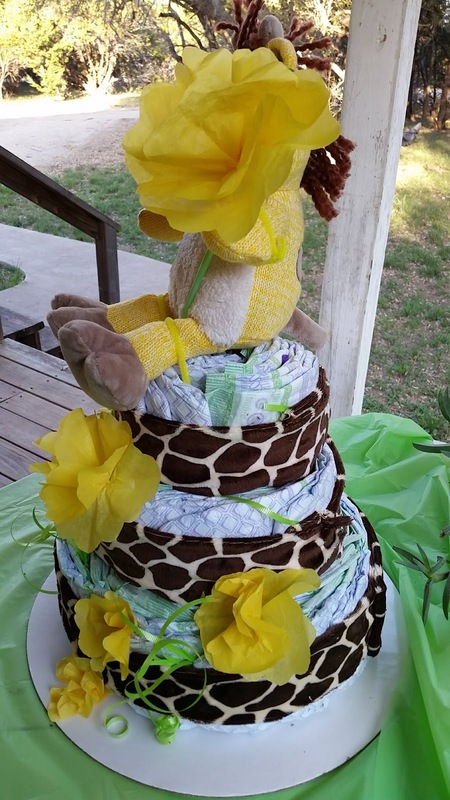 Then adorn with your fabric, ribbon, baby accessories or bows. 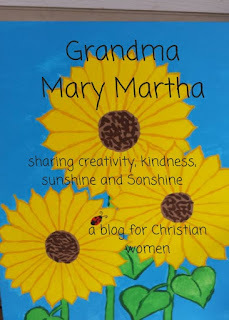 Dollar store or Mama's theme can be a great inspiration, as well as what you have at home. 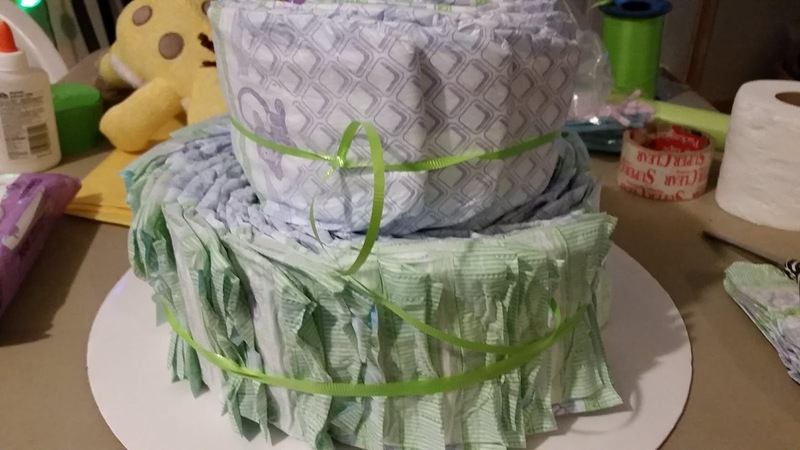 I already had the tissue paper, ribbon, craft-ties, and cardboard cake round (bottom platform). 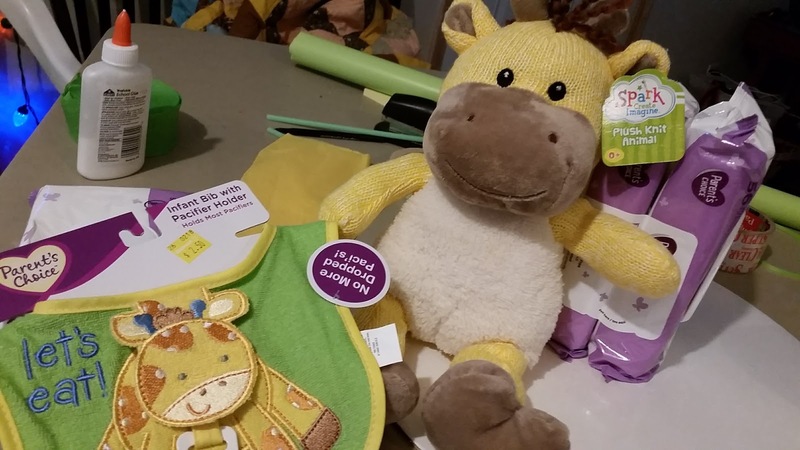 I bought the topper giraffe for about 6 bucks, the apron for $2.50. 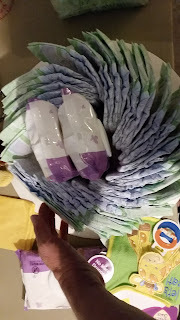 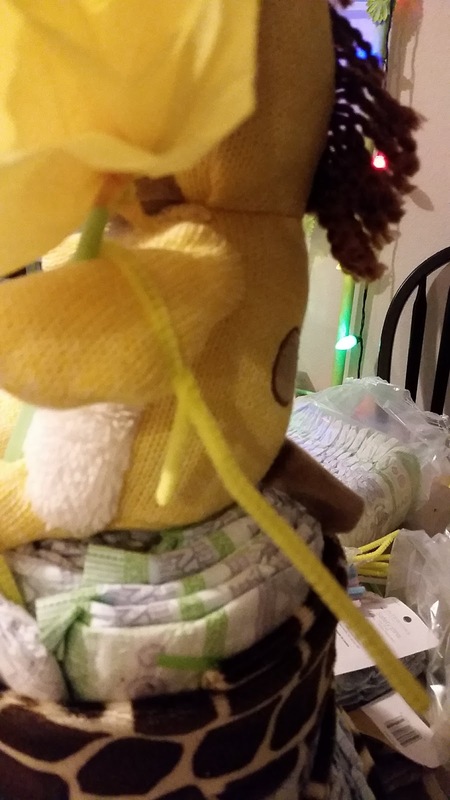 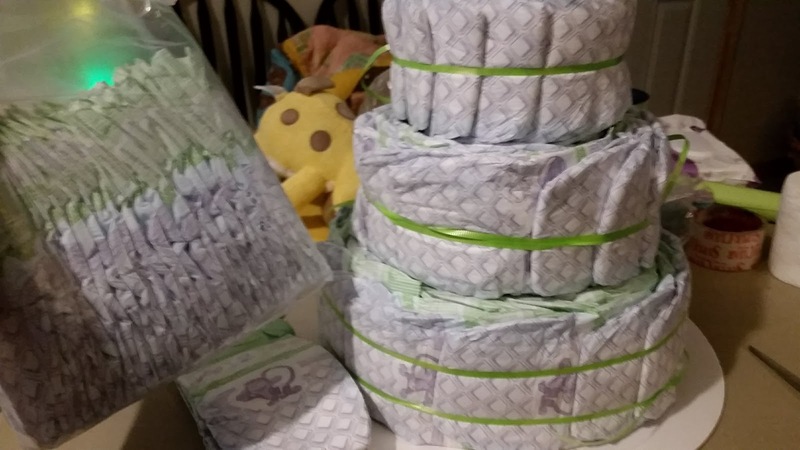 The baby wipes used were three packages for about 3 or 4 dollars, and I used 80 diapers for $8. 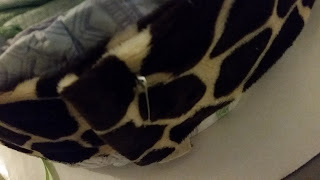 I used a safety pin to secure the ornamental fabric in the back. I used craft ties to poke ribbons and flowers between layers, and also to secure the topper into place. 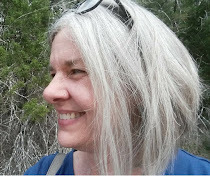 Look above. 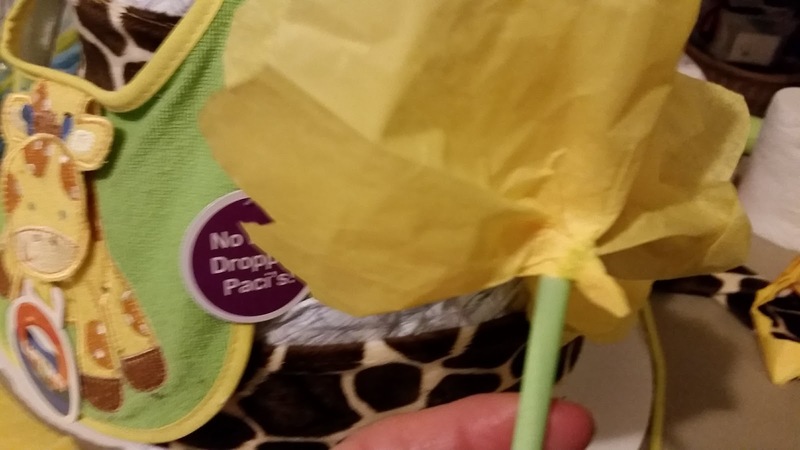 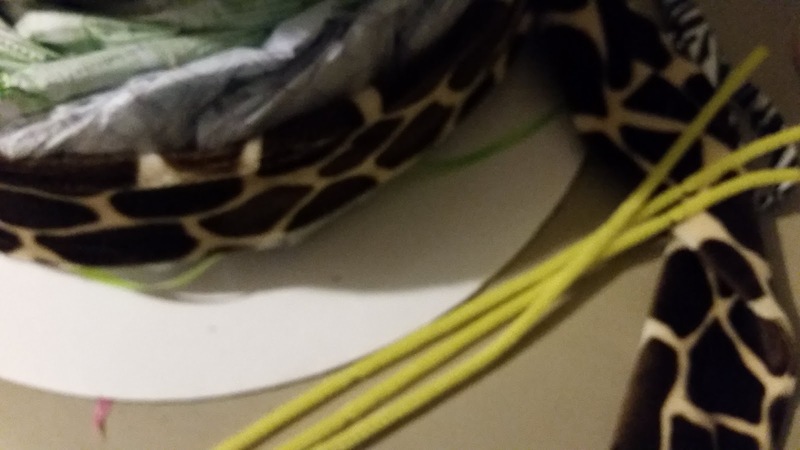 I used craft tie to help giraffe hold his straw flower. 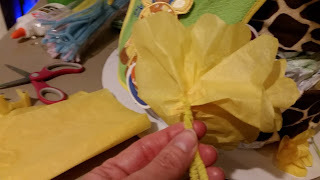 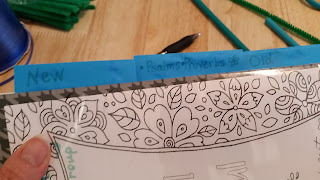 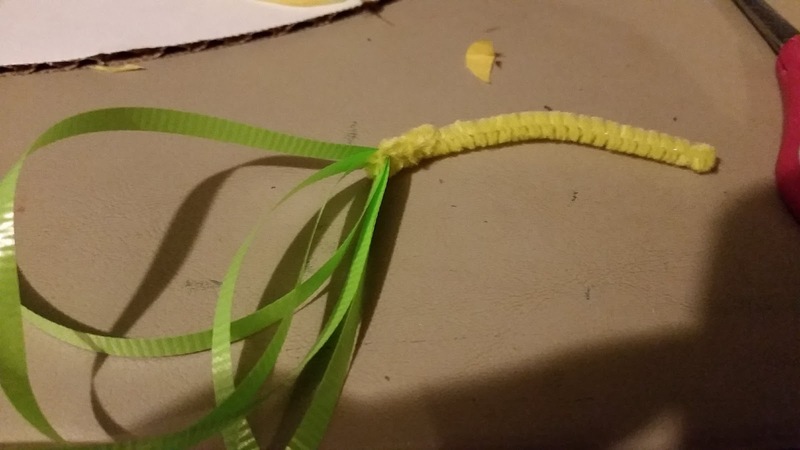 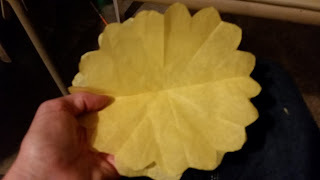 Below, see how I made the decoration ribbons. 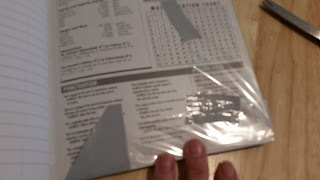 I am sorry that the above picture is not clear. 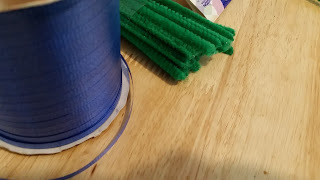 Very close to the middle you can barely see a dark colored STRAW (drinking straw from the dollar store). You will need to use a straw or a stick (can use k-bob cooking skewer) to poke from top layer to through lower layer. 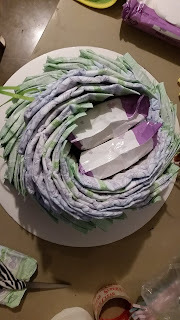 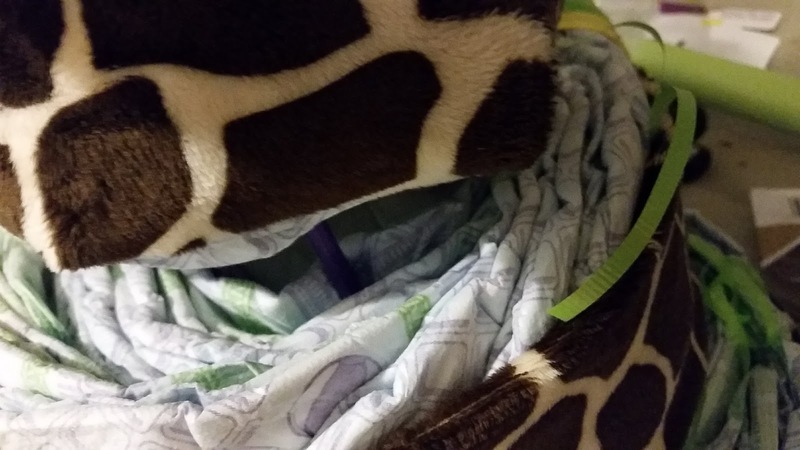 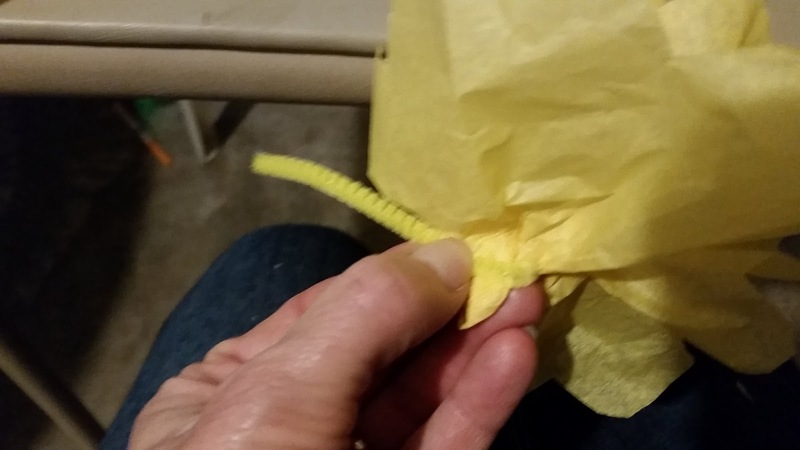 Do this as needed, to secure layers of the diaper cake so that top layers do not fly off.